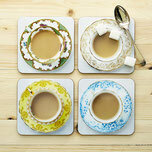 The perfect gift for tea lovers, Cuppa Coasters reflect the love of tea around the world. 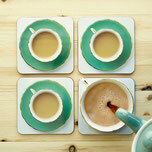 For those who like theirs milky with sugar, black and strong, or green and herbal, Cuppa Coasters blend practicality with style for a lovely cuppa, served beautifully. To/From teabag gift label included. Gift wrapping available too! 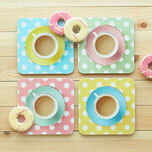 Cuppa Coasters launched with the ‘Afternoon Tea Collection', which includes the sets: Afternoon Etiquette, High Teal, Sunny Poppies and Delightfully Dotty. With delicate patterns or bright bold colours, each set of four coasters represents a truly British attitude to taking time out to enjoy a cup of tea, served in style. Fine China & Indian Tree are part of the latest collection. The Silk Road was an ancient network of trade routes that connected Asian and Western cultures. Exquisite Oriental designs were exchanged by merchants along the Road, which also carried an abundance of tea. It was the beginning of a global economy and, of course, a lovely cuppa served beautifully. I'm proud to say I package each and every coaster set myself. 18 lines sliced, 12 rounded corners punched, 5 stickers, 3 folds, 2 edges scissored, 1 staple, and repeat.